Spaced out: Are HR executives, IT departments and facilities administrators ready for the challenge? The workplace of the future will be very unlike what we have experienced for several decades. The era of the dedicated office building, desk and PC is slowly coming to an end. Soon, employees working for most businesses, particularly in the technology and service industries, will no longer troop into an “office" and occupy their assigned desks, nor will “personal" computers and cubicle walls mark the territory for each “worker". Team meetings and gossip sessions will stop originating at the coffee machine or the water cooler. The new and improved workplace is going to rest on the pillars of flexibility, mobility and collaboration. With enterprises moving towards the “more for less" and “asset lite" models across business operations, the “physical" workplace will not be far behind. In a bid to reduce their total cost of ownership, enterprises (particularly small- and medium-sized businesses) are looking, and will increasingly look, at moving their infrastructure and IT requirements to the Internet or, as it is now called, the cloud. Escalating real estate costs will force the traditional cubicle to change into a personal virtual office, with the same space being customized for several employees with the swipe of a card (or biometric scan of an eye). The most significant trend in information technology has been that of IT services emerging first in the consumer market, for individuals, and then spreading to the enterprise market, for businesses (what IT research and advisory firm Gartner called the consumerization of IT). The focus on employees is shifting from just “workers" to collaborators and co-creators, those who are rapidly adopting social networking and communication tools such as Twitter, Facebook and Skype in their personal lives. Enterprises are now catching on to this trend; unlike traditional, linear applications such as the email and static Intranets, Web2.0 tools such as Chatter, Jive, Yammer and Injoos provide real-time, collaborative platforms for engagement, knowledge creation and sharing, and activity management. “The more effortlessly employees can communicate, collaborate and share new insights with one another, the faster an organization can respond to changing customer expectations and business conditions," said Ross Mayfield, CEO, SocialText, at the Web 2.0 Expo in May. 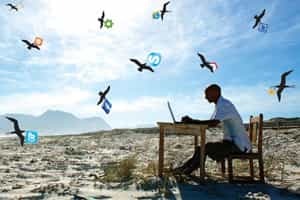 The fine line between the virtual and the real is becoming finer with the rise in popularity of virtual work environments such as Teleplace for decentralized teams akin to an office version of Second Life. Mark Levitt, program VP, collaboration and Enterprise 2.0 strategies at IDC, said in a press statement, “Teleplace provides a rich 3D collaboration environment that makes virtual meetings, presentations, training sessions and other interactions as real as possible without getting on a plane." At least one-third of organizations will support social networking this year, predicts a 2010 Forrester report. Are organizations prepared for this change? Are HR executives, IT departments and facilities administrators ready to face the challenges that a distributed and decentralized workforce is going to bring? Since these changes are already occurring around us, enterprises have no option but to rework their IT, infrastructure and facility strategies. Network architectures need to shift from centralized data storage and fixed LANs to distributed access—mostly over the Internet. The proliferation of video-based collaborative tools catering to distributed teams will put greater pressure on the IT and network infrastructure, leading to a rise in corporate content distribution network (CDN) technologies used to deliver content more efficiently to distributed locations. Security and privacy issues will multiply, with a plethora of end points that IT teams cannot physically control. These implications are more serious from a people management perspective. Business leaders and managers will be required to manage by outcomes rather than by observation. Unfortunately, research by the University of California Davis suggests that even today, when bosses and co-workers see an employee at work, they tend to think more highly of that person, and their evaluation is even more favourable if the sighting is after normal business hours. Several academic studies, including Jay Mulki and others’ article in the MIT Sloan Management Review, Fall 2009, (Workplace Isolation, Salesperson Commitment and Job Performance), have shown that remote workers tend to suffer from a feeling of isolation, which may affect their productivity and, in turn, retention rates. Given that effective communication is almost only based on body language and paralinguistic cues, team building and motivation in a globally distributed team will require the adoption of high-end video conferencing systems such as Telepresence that can create a virtual presence. If managers aren’t already thinking about these issues, they must. Their employees surely are experiencing these changes and adapting their lifestyles rapidly. They will expand these tools into the work environment, unofficially if necessary. Can enterprises shake off their inertia and embrace the new world before it is forced on them? Srinivasa Addepalli is senior vice-president—corporate strategy at Tata Communications.